This page provides you with Digital Marketing Manager resume samples that you can use for inspiration in writing your own resume, or for creating one through our easy-to-use resume builder. Below you'll find our how-to section that will guide you through each section of a Digital marketing manager resume. There is a current trend which makes a lot of firms require the service of a Digital Marketing Manager. Good news, you are in high demand! Bad news: this is an extremely competitive industry. The simple truth is that we know you have the skills required to make a very good digital marketing manager. However, if your resume has been standing in the way of getting that dream job, we are here to help you. You can be rest assured that you are in safe hands as we’ll be showing you the best Digital Marketing Manager resume sample. The field of digital marketing is quite competitive and requires a lot of skills and technical know-how. We are now here to help you fight through the competition. The truth is that the job a digital marketing manager does is very crucial and no firm would want to take chances. This is why your resume needs to have a certain appeal to it. Regardless of your years of experience in the field, only a good resume would single you out as a good fit for the job. Your days of dreaming about that being a top digital marketer are over as we are here to make it a reality. We are going to take you on a steady journey on how to write a very good resume. Let’s begin! 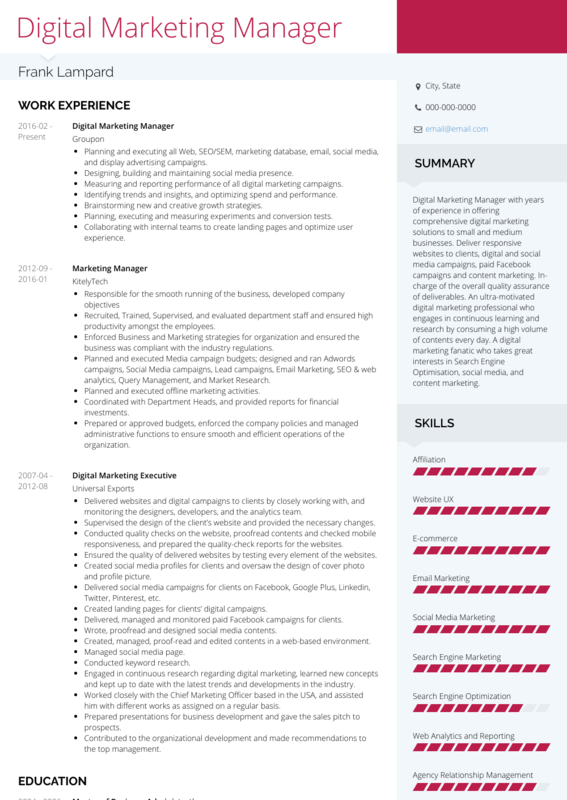 How to Write Digital Marketing Manager Resume? The first thing you need to note is that you need a quite simple layout. There is no need to make things appear too complicated. Considering the fact that you have had quite some working experience, make use of the reverse-chronological order. This will help to present your most recent working experience to your potential employers. Next thing you have to decide on is the font. Pick something which is quite easy to read. Writing your resume a good font will increase the interest of the recruiter in your resume. Make sure that each section of your resume is written quite clearly and broken down properly. Do not muddle things up hoping that the recruiter would take time out to search for details. That would be a bad move. Make things easier for them and make everything so clear and easy to read. Clearly divide your resume into sections such as employment history, education and skills. Fill in each section properly and clearly state your skills. The main reason behind writing your resume is to sell yourself without even getting to see the recruiter. Saving it as a PDF is also very advisable. This section is very delicate and can be a deal breaker for you. Never ignore the summary section and when writing it, take your time to complete it properly. It is the fastest way to make an impression on your recruiter. If you have a lot of information in your resume, this section will help the recruiter make his judgment faster without having to read through for a long time. These are a few tips to consider when writing your summary section. State clearly your knowledge of the job post. Emphasize on your managerial skills. Provide any other skills which are relevant to the job. This section is another chance for the recruiter to know your type of person and understand if you fit into the standards for the job. Certain jobs even require a number of years of working experience. There’s nothing wrong in including a brief work history regardless of your experience in the field. The important things about this section are clarity and honesty. Avoid using friends as reference. Make use of some credible references. For more tips on writing the best work experience section for a great Digital Marketing Manager like you, check out our detailed resume guide. The schools and institutions you attended. The duration of your time in school. The duration you spent studying digital marketing. The degrees and qualifications which you possess. The skills you possess determine if you are a good fit for the job or not. This is another type of tactic employed by recruiters to narrow down their targets. What skills are you stating in your resume? Are they relevant to the job post? Are they not enough? We can help you decide on the best skills to possess and write down in your CV. It is also our duty to make sure that the skills you are filling into your CV are the relevant ones which your employer is searching for. Irrelevancies will only make things more difficult. Make sure you do your best to possess the best skills for the job. Yes – make sure you have a cover letter readily available. Follow our tips here. Have a professional tone to your resume. Include links to profiles online that are business related. A professional format goes a long way. Don’t link to unnecessary social media accounts. Don’t go back to your school days for references. Well, that’s it! You now have access to a standout Digital Marketing Manager sample: if you are also looking for the best Digital Marketing Manager templates, you should check this masterpiece we have been working on here : many professionals like you have successfully used it to take their career to the next level.